While Monet is showing at the Grand Palais (see article) under the care of Richard Thomson, his wife Belinda Thomson is the curator of the Gauguin retrospective at the Tate Modern, the first one ever organized in the United Kingdom, which is then traveling on to Washington. 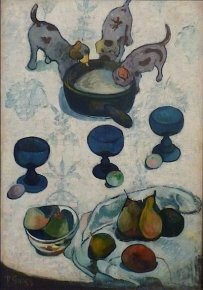 The very fine qualities of the Gauguin exhibition equal those of the one in Paris. But as happens with Monet, we do not learn that much more about the artist and his work. It takes a good deal of ambition to tackle a subject which has been treated so often as either Monet or Gauguin. The latter claims to renew the view of the painter and sculptor but the theories proposed, which are indeed perfectly correct, are not entirely new. 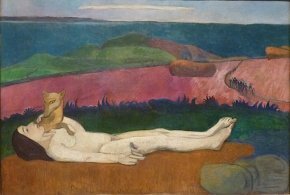 Belinda Thomson’s introductory text demonstrates that Gauguin, “maker of myth”, placed a good deal of importance in staging his own life and that this was in fact his primary creation. It also underscores the increasing gap which the artist deliberately placed between himself and the Impressionists, finding that their art was not intellectual enough. In fact, Gauguin was closer to the Symbolists than to Monet, Sisley or even his master Pissarro, if only because of his literary sources and his determination to express his ideas through his paintings, even those with no narrative content. The essay is interesting, everything it says is exact but, again, not particularly original. 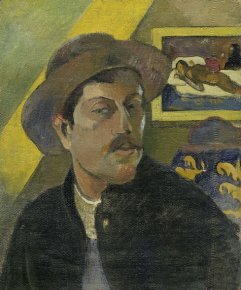 Several other articles introduce the catalogue, including one by Philippe Dagen on Gauguin and politics. Although we regret the lack of entries, in this case it is less significant than in other exhibitions, as most of the works are quite well known and their place in his career is generally rather obvious. The introductory essays to each of the different sections are enough to understand the reasons for these groupings. The exhibition begins with a dazzling series of self-portraits (ill. 1) and its connection to one of the artist’s most moving paintings, his Christ in the Garden of Olives (ill. 2) which can be found further along in the show. 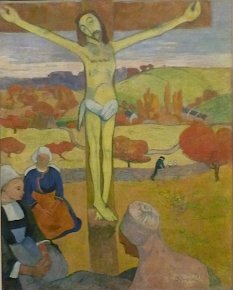 Gauguin at times became a religious painter and his representations of scenes from Christ’s life, seen through the prism of his stays in Brittany, are among some of his most touching works (the Green Christ from Brussels, The Yellow Christ from Buffalo, ill. 3). 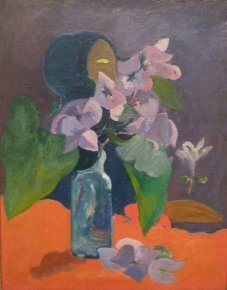 There follows a section named “Making the familiar strange” which shows how the artist introduces a touch of the bizarre, at times difficult to interpret, in his still-lifes and representations of everyday things, notably with the help of objects or symbols apparently having nothing to do with the scene depicted. The head of a Tahitian idol rises out of a flower vase (ill. 4) or the wall paper in a child’s room transforms itself into a dream sequence. At times, Gauguin introduces his own sculptures or ceramics, extremely enigmatic themselves, into these still-lifes. Even something as ordinary as three puppies lapping seems to go beyond the visible representation (ill. 5). This element of the strange can be found in all of the following rooms, whether in the Brittany landscapes or the religious scenes mentioned above. There are many famous masterpieces here, from The Loss of Virginity (ill. 6) (here again an eminently Symbolist canvas) to The Vision of the Sermon (Edinburgh), as elsewhere throughout the entire exhibition. Although they are not presented chronologically, the subjects lead visitors in a logical way towards the Polynesian works which essentially make up the last part of the show. 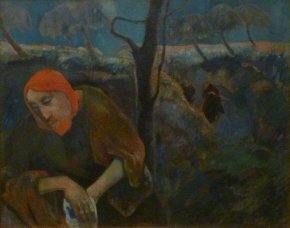 A chapter highlighting Gauguin’s vision of women underscores just how ambiguous it is and also points out the most persistent themes, such as water, waves, and figures (Eve, Oviri…). A remarkable work in this section is the beautiful wood relief Papa Moe which will most likely join the collections at the Musée des Beaux-Arts in Lyon  very soon (see news item of 24/6/10). 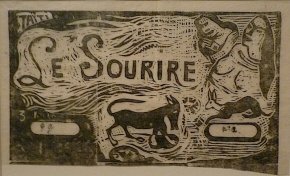 Finally, we would like to point out that much of this retrospective is devoted to Gauguin’s graphic works, not only his drawings (ill. 7) but also his engraved wood pieces (ill. 8). 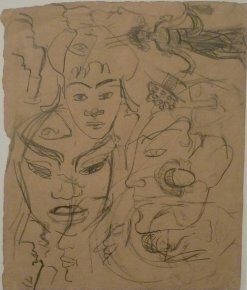 There is also a room offering documents of that era, posters, photographs and manuscripts, placing the artist and his production in the context of that time, notably the developing taste for trips to faraway places. Under the guidance of Belinda Thomson, Gauguin. Maker of Myth, Tate Publishing, 2010, 256 p., £24.99. ISBN : 9781854379023. Visitor information : Tate Modern, Bankside, London SE1 9TG. Tel : +44 (0) 20 7887 8888. Open every day from 10 am to 6 pm (10 pm on Fridays, Saturdays and Sundays). Tickets : £13.50 (reduced : £10). The catalogue gives the names of the current owners, Sandro and Marta Bosi.